A tasty mixture of spicy shrimp, sautéed onions & bell peppers, garlic, and melted cheese crisped in a tortilla. These quesadillas are simple and a delicious way to enjoy shrimp! 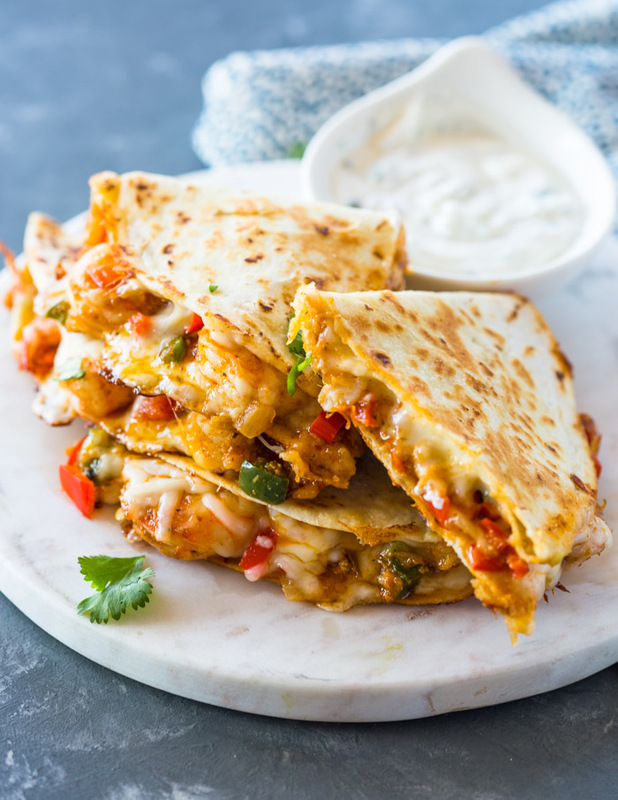 These amazing shrimp quesadillas are a must try. We’ve made them countless time and will continue to make them forever. They’re super quick and easy to make, packed with flavor and highlight shrimp in a festive and spicy way. And this is so easy ,It’s all made in one pan in under 20 minutes tops ! Heat 1 tablespoon oil in a large skillet or pan. Add the chopped onion, bell pepper, and garlic to the pan. Cook for 1 minute or until tender. Add the shrimp and taco seasoning and cook for another 1-2 minutes or until shrimp begins to turn pink. Transfer the mixture to a bowl and rinse and whip down the pan with a paper towel. Return the pan to the heat and spray cooking spray or brush with about 1 teaspoon vegetable oil. Place a tortilla in the pan and sprinkle cheese on one side of the tortilla. Spoon about 5-6 shrimp or enough to cover with another sprinkle of cheese. Fold tortilla in half. Cook for 2-3 minutes on each side or until golden and crispy. Repeat for reaming tortillas. Serve with Sour cream, salsa, or guacamole.